The re-enactors at Marathon probably won't have abs quite so chiseled. More than 200 Greek cosplayers will dress in 300 BCE period armor and weapons. The story of the Battle of Marathon has intrigued historically-minded folk for more than 2,600 years. 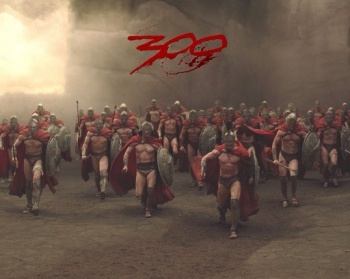 The Athenians defeating the Persians at Marathon was the precursor to the second invasion of Greece as dramatized in the film and comic book 300. Not only did Marathon consolidate the Greek city-states into a more cohesive nation and spur the growth of human civilization in Europe, but the legend of the Greek messenger running 22.6 miles to Athens with news of the victory over the Persians is the basis for the long-distance race many people kill themselves training for today. To commemorate the battle which took place on the plain of Marathon in 490 BC, more than 200 people from various locations around the globe will re-enact the confrontation as authentically as possible with blunted bronze weapons and period-appropriate armor and clothing on September 10th in the Greek town. Getting all of those people together and equipped has practically taken more logistical expertise than the real battle. "It has taken us three years to equip even that many," says Christian Cameron, a Canadian participating in the recreation. "Correct armor and weapons - not to mention period textiles and dyes - take hundreds of hours to make." The cost of each pretend warrior is nothing to scoff at either. "Most people at Marathon will be wearing five to ten thousand euros [$7,200-14,500] worth of equipment, much of it made by hand," Cameron said. The whole event will occur on the presumed site of the battle and will feature a plethora of cultural activities like dance and crafts from Greek history. The armies will even camp just like they did in 490 BC and only cook food that would have been available to military forces at the time. Let's just hope that the enthusiasts will be using modern septic systems, or at least have a place to do laundry. Do you realize how bad armies smelled back then? And it's impossible to get poop stains out of bronze armor, believe you me.